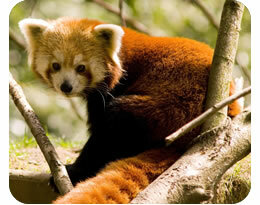 Red pandas have thick dense fur and a long bushy tail to keep them warm. The fur on the soles of their feet also prevents them from slipping on wet branches. Mainly active at sunrise and sunset, they spend the rest of their time asleep in the trees. Red pandas have become endangered through human activity – the cutting down of their forest homes and the bamboo that forms the main part of their diet. Red pandas have an extra ‘thumb’ for gripping food; this is actually an elongated wrist bone.